Canada’s Green Cities – Armed with a $550-million Green Municipal Fund courtesy of the federal government, the Federation of Canadian Municipalities has been doling out grants over the past seven years for pilot projects and capital spending designed to reduce energy use. Here are some of the more innovative initiatives. Mercury Levels in Canned Tuna – CBC tested mercury levels in canned tuna purchased in Vancouver, Winnipeg and Toronto and found 13 per cent exceeded the federal government’s guideline of 0.5 parts per million. I thought this comic by Lynn Johnson so nicely summed up the frustration many of us feel. Those of us who take a lot of personal responsibility in our daily activities to reduce our impact on the environment still look around and see the overwhelming tide of civilization washing over us, negating everything we have done. But we persevere anyway. Hoping to lead by example or maybe just to say we did what we could. In its most straightforward formulation, sustainability would require that a resource be technically managed in such a way that its contribution to human welfare is conserved or improved for succeeding generations. Interestingly, Kennedy’s analysis of this statement is heavily human-centric (there is no mention of conserving nature for nature’s sake, but only as it provides some resource base for people), but also gives considerable attention to issues of equity, which I find somewhat lacking in many discussions of sustainability. These scenarios suggest a problem with the concept of sustainability, which turns out not to be just about resource use, efficiency of utilization, and conservation. Instead, the term carries with it strong social, economic, and cultural attributes. Different societies will therefore create their own definitions of sustainability and their own criteria for achieving it, and they are likely to set about the task in their own ways. Again, the fact that different people ascribe different meanings to the concept of sustainability is a problem because many of our most pressing environmental problems are global, or certainly are multi-jurisdictional (they cross political and cultural boundaries). Is there any hope that a common meaning of the term sustainability will be determined and if it is not, do we still have a chance of solving common-pool problems? Yesterday, the Science section of the New York Times featured an article on the visible impact of shrimp trawling wordwide: Satellites Show Harvest of Mud That Trawlers Leave Behind. This is an interesting use of Google Earth for research and presentation purposes. Although I think Google Earth has a long way to go before it will be adopted by “the masses” it is simple enough to install and use that it is a viable way to get information across to those who are motivated enough to seek it out. The gist of this research project is that when shrimp trawlers drag their gear along the bottom of the ocean, not only do they damage the ocean floor and kill many non-target species (aka bycatch or discards and can constitute as much as 98% of the total catch), they stir up so much mud that they actually affect water quality in a large area – large enough to be visible from space. Of course, image resolution is so fabulous now that almost everything is visible from space. But the point is that the previously unseen impact of one type of fishing is now clearly visible to anyone who chooses to look, from the comfort of their own computer. If you want to take the “tour”, Kyle Van Houtan and Daniel Pauly have posted a web site with trawler mudtrail images in Google Earth with full instructions and more information about their project. … is a campaign with WaterAid. The campaign is designed to raise awareness of WaterAid and their vision – a world where everyone has access to safe water and effective sanitation. Instead of a more traditional petition I Knit is proud to be making a spectacle! Our ‘knitition’ will force world leaders to sit up and listen. The river will travel to future WaterAid campaigning events and carry the message. Our demands are simple – let the water flow! Over the weekend, I got myself a slow cooker (aka crock pot). I’m hoping to use it once or twice a week to increase the number of homemade meals we eat (as opposed to eating out or resorting to pre-packaged food). All in all, I think this will be a good thing mainly by reducing the amount of packaging we generate from store-bought meals and styrofoam from restaurant takeout. But while running it for 8 hours on Sunday, I started wondering about the net energy impact of this new appliance. Turns out, it’s not so easy to figure out whether we’re coming out ahead. One problem is that we have a gas stove, so it’s like comparing apples and oranges. Just for giggles, though, here’s a summary of what I’ve found. You can draw your own conclusions. 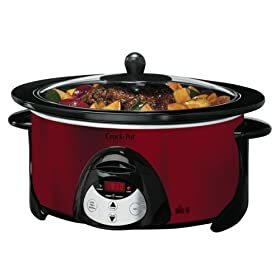 According to Clallum County, WA Public Utility Division, a crock-pot runs at 100 watts (Typical Appliance Energy Use and Costs) so running it once a week for 8 hours means 3.2 kWh/month. If you have an electric stove, the range runs at 12,500 watts, while burners average 1300 – 2400 watts apiece. Any smarties out there who can compare kWh to natural gas use by the typical stovetop, I’d love to be able to compare the amount of energy I would normally use to simmer soups and stews during the month on my gas stove…. The Pennsylvania Public Utility Commission recommends using a crock-pot rather than gas oven and/or stovetop (Pennsylvania Utility Choice) as does the Delaware Department of Natural Resources and Environmental Control (Pollution Prevention and You). Crock-pot use even gets the thumbs-up by GreenerChoices.org (appears to be a project by Consumer Reports). No hard numbers to help compare though….